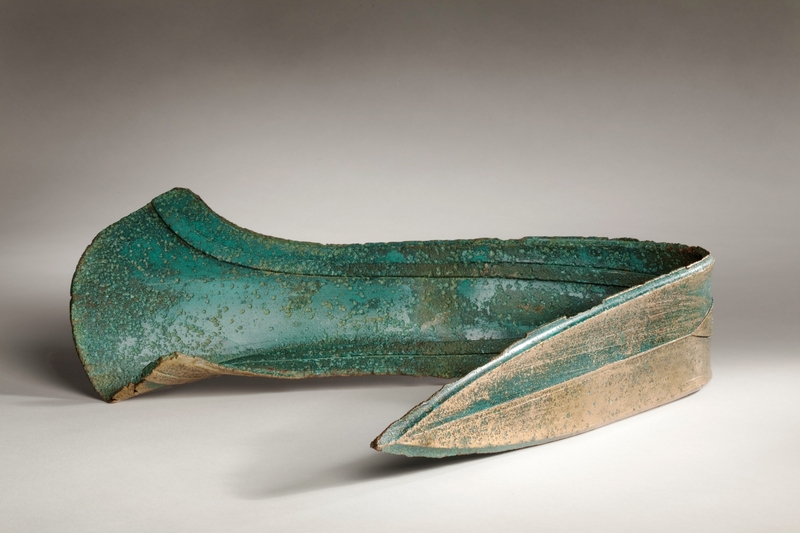 One of my all-time favorite finds is the ceremonial dirk 27 inches long discovered in a field in East Rudham, Norfolk, and used as a doorstop for 13 years until it was identified as an incredible rare Bronze Age artifact and bought by the Norwich Castle Museum and Art Gallery in 2014. Seeing that dirk in person is high on my bucket list of nerd pilgrimages. 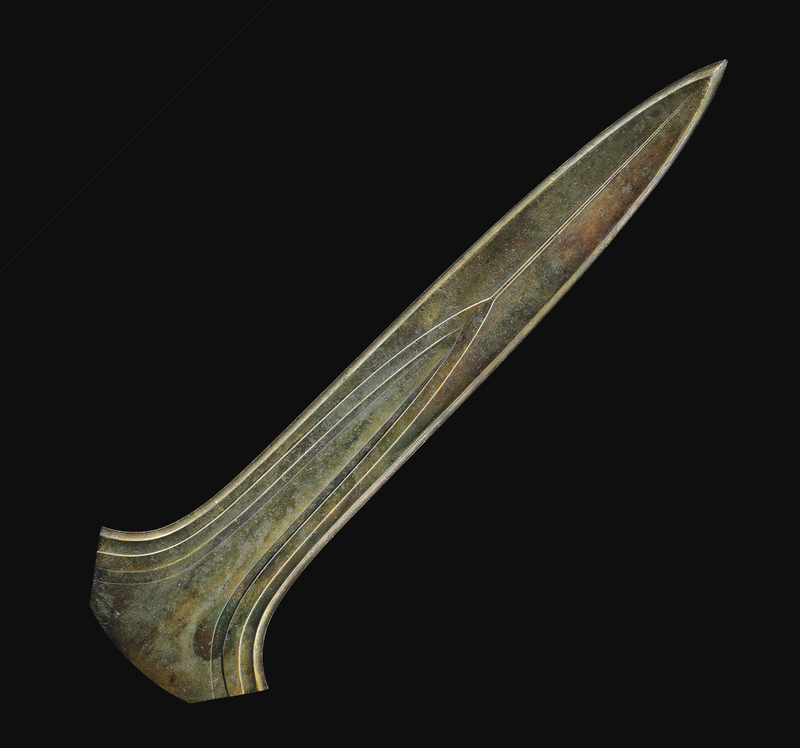 Called the Plougrescant-Ommerschans type after the locations where the first two were found, only five other examples of Middle Bronze Age oversize ceremonial dirks are known in the world. They have an abstract geometric decoration, dull edges and tips and no handles, which is how we know they were meant for ceremonial purposes. All of them are so similar in design and size they are believed to have been produced in the same workshop, very possibly by the same hand. When I was writing the story about the Norwich Castle Museum’s acquisition of the Rudham Dirk, I was able to include photographs of four of the five known examples, all of which are in museums. The one exception was the Ommerschans Dirk (1500-1350 B.C. ), the co-type find which was discovered in late 19th century in a field between Witharen and Ommerschans in Overijssel, east Netherlands. There were no photographs of it because it was found on the Junne estate, one of the largest private estates in the country, then owned by Eduard Lüps and he didn’t exactly broadcast the find far and wide. The details of the discovery are hazy. All we know is that sometime between 1894 and 1900, the Lüps’ forester found the dirk deposited on a birch platform together with a number of artifacts including a Sicilian bronze razor, two metal chisels, a stone chisel, a stone tablet and a whetstone. The forester nailed them all to a wooden board and that’s how they were kept for years. The news of the discovery gradually spread and in 1927 Jan Hendrik Holwerda, archaeologist and director of the Rijksmuseum van Oudheden (the National Museum of Antiquities) in Leiden examined the dirk. Holwerda was deeply impressed by the artifact, which is saying a lot because he was dubious about the very existence of a Bronze Age. He attempted to buy the dirk and the other objects discovered with it, but Lüps’ price was so astronomical the museum couldn’t afford it. 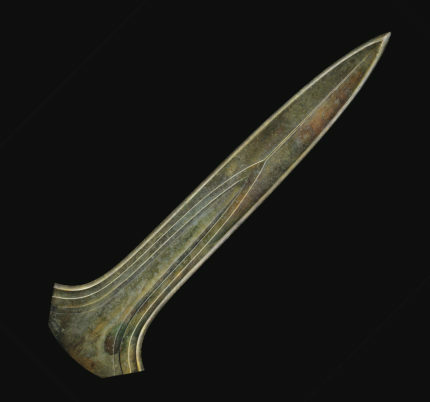 Holwerda had to be satisfied with a single picture and a cast of the dagger. In the 1930s the Lüps family moved to Bavaria and took the dirk with them. To all intents and purposes, it disappeared. It wasn’t loaned or seen in public. In the 1970s, director of the Rijksmuseum van Oudheden Louwe Kooijmans, an expert in Netherlands prehistory, tried again to acquire the Ommerschans Dirk to no avail. 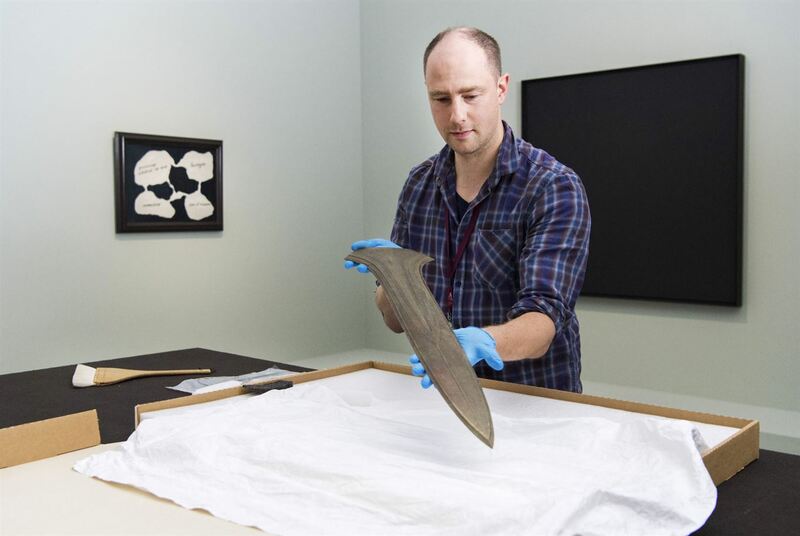 In 2015, the museum’s prehistory curator Luc Amkreutz tried to get the dirk on loan for a great sword exhibition that would have brought all six of the Plougrescant-Ommerschans type blades together for the first time. The family refused. They were apparently concerned that the dirk would be confiscated by the government once in the Netherlands, on what grounds is unclear as the title was clean. The Netherlands’ Culture Minister Jet Bussemaker even wrote a letter assuring them that there was no danger the artifact would be confiscated, but at the last moment the family decided against the loan. The exhibition went on with the 1927 plaster cast in place of the real deal. Then, at long last, a ray of light: the Lüps descendants were ready to sell the dirk to the museum. The museum made an offer based on the sale price of the Rudham Dirk (£40,970 in 2014) and the Jutphaas Dirk which they had acquired in 2005. They were never told their offer was too low or given a counter price. Instead the owners just put it up for auction at Christie’s London in July 2017 along with the surviving artifacts discovered with it. That turned out to be a wise choice from a financial perspective at least, because it shattered the previous prices and blew through even Christie’s pre-sale estimate of £80,000-120,000 to sell for £485,000 ($623,000). It was the Rijksmuseum van Oudheden who made the winning bid, 90 years after it first tried to secure the dirk for the nation. It now owns two of the six, and the two that are in the best condition to boot. The museum’s glorious long-fought win makes a tiny one possible for your faithful blogger. For four years plus it has niggled at me that I almost, ALMOST, got pictures of all of the Plougrescant-Ommerschans dirks except for one of the two in the name. That blemish on my record for photo acquisition is heretofore healed. The dirk is now on display in a special exhibition at the Kröller-Müller Museum in Otterlo. For the Love of Art brings together 80 extraordinary pieces of art and archaeology acquired by forty Dutch museums in the last ten years. The Ommerschans Dirk is the oldest object of the 80.